We recently took JC’s Journeys on the road for a few days to explore some other areas and share what we found with our followers. One of our planned stops: Rio Celeste. This was an enticing place to start our journey as all we really knew about it before arriving was that the turquoise colored water flowing through this river was a sight not to be missed. Here are 3 points we’d like to share for your visit to Rio Celeste. 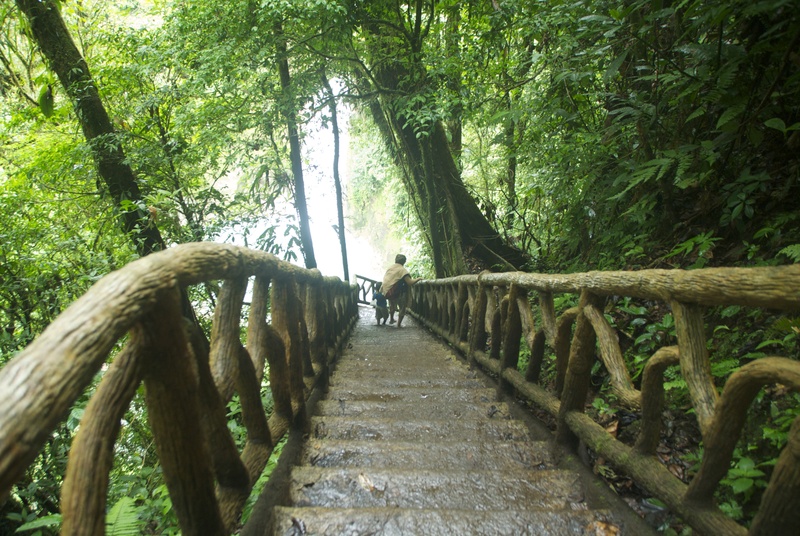 There are a few ways to get to Tenorio Volcano National Park. Rio Celeste is in this park which is fairly easy to navigate. We started out from Florencia in San Carlos and headed northwest. A popular route for most tourists would likely be starting out from La Fortuna, the town near Arenal Volcano. Taking Route 4 leads you to an entrance after about an hour and a half, which becomes a dirt road for several (around 20) kilometers. You’ll pass pineapple plantations and lots of other fields of fruit along the way. A 4×4 vehicle is recommended as this part of the road was pretty bumpy and a little steep and rocky in a couple parts. Continue along this road and you’ll reach the entrance where there’s parking, a restaurant and souvenir shop. Rio Celeste is located in a rainforest, so… take rain gear! We arrived when the park opened early in the morning and there were downpours just hours before. Needless to say, the trail was a little muddy. But nothing a good pair of closed tennis shoes or hiking shoes can’t handle. Rubber boots are offered for rent at the entrance, but small children’s sizes were not available, and boots actually seemed to make the hike more challenging anyway. A rain jacket or quick drying clothes are a good idea, as well as an extra pair of shoes or flip flops for when your shoes are muddy and wet. Also take a hat, mosquito repellent as always, and lots of water, even though it’s wet it can get very humid, so be sure to hydrate! Always a good idea to pack a snack or lunch also, even though there are places at the entrance to eat, as well as small sodas (restaurants) on the road leading to the entrance. At the entrance you’ll probably be offered a guide for about $30. If you’re not an experienced hiker, never been to Costa Rica, or just would like some extra guidance and learn about nature and the area, this is a great idea. However, if your main goal is to see the cool blue river, you can probably do OK on your own. If you have small children or elderly members in your group, there’s a beautiful waterfall maybe just 1 km from the entrance and down a great deal of stairs. This is a great option as there’s not too much ‘hiking’ involved, and the waterfall is still a beautiful sight (however it is a steep climb back UP the stairs). To see the point where two rivers merge to create the chemical reaction that turns the water the deep blue hue, you’ll have to hike a bit longer. From the waterfall, it’s about another 45 minute hike, moderate incline, through some pretty deep muddy spots. Don’t be afraid to just tread through the mud, it’ll make your hike a lot faster, and you can hose off your shoes at the entrance. Do be careful along the edges, as some spots can drop off pretty steeply and there are no ropes or railing. This entry was posted in Costa Rica, Nature, Travel and tagged costa rica, Costa Rica National Park, Costa Rica waterfall, Nature Tour, Rio Celeste, Road Trip Costa Rica, Tenorio Volcano, Travel and Tourism, travel costa rica. Bookmark the permalink. Rio Celeste is so beautiful, glad you had a great experience. I just photographed a wedding there, I posted some photos on my blog today, if you would like to take a look. Fantastic shots of a beautiful wedding & location. Thanks for sharing @photoscostarica!